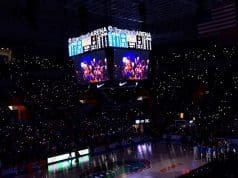 The Florida Gators will host their first junior day for the 2020 class on Saturday and the coaching staff is expected to host a list of top prospects. Dan Mullen and his coaching staff already have seven commits for the class of 2020 are looking to add to that this weekend. GatorCountry brings you a visitors list preview for this weekend’s big junior day for the Gators. 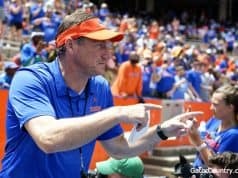 The Gators coaching will host all seven of their 2020 commits this weekend and many of those guys are big recruiters for the Gators. Defensive end Gervon Dexter and athlete Jaquavion Fraziars have both been big recruiters for Florida and are scheduled to be in town this weekend. Athlete commit Keyvone Lee and receiver commit Leonard Manuel are two of the higher rated commits in the class and both are scheduled to visit Gainesville on Saturday. Quarterback commit Anthony Richardson will make the short drive over to campus on Saturday to visit with Mullen and the coaching staff. Defensive end Josh Griffis has been committed to Florida the longest out of the 2020 class and he’s also scheduled to be in town on Saturday. Safety commit Rashad Torrence hasn’t been on campus since he committed but that will change on Saturday when he’s scheduled to visit Gainesville. One of the best players in the country will visit Gainesville on Saturday when running back Demarkcus Bowman visits Florida just a week after visiting Clemson. The Gators are one of the top teams in Bowman’s recruitment early on. Florida will also host Alabama quarterback commit Carson Beck on Saturday as the quarterback is looking at other schools after the Crimson Tide lost their offensive coordinator Dan Enos to Miami. Receivers Marquez Bell and Xzavier Henderson are also scheduled to be in town. 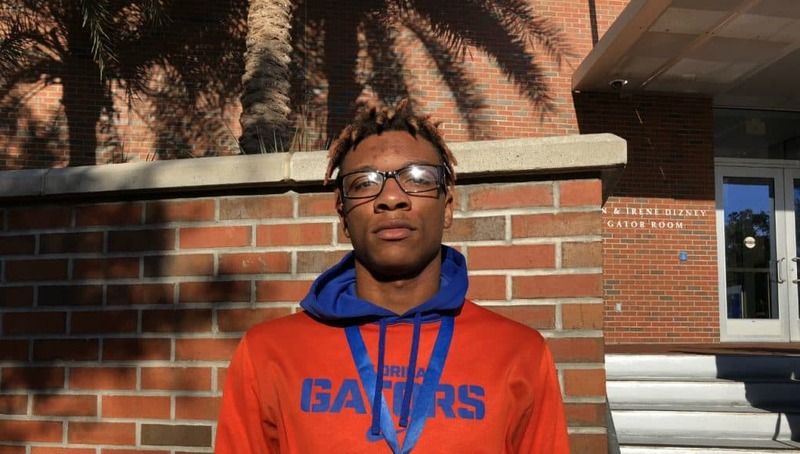 Henderson is the younger brother of Florida cornerback CJ Henderson and the Gators are high in Xzavier’s recruitment as well. Offensive lineman Josh Braun is scheduled to visit Gainesville this weekend with his older brother and Georgia Tech lineman transfer Parker Braun. The younger Braun has visited Florida several times in the past. Joining Braun on the offensive line is Jalen Rivers who is a top prospect from the Jacksonville area. Rivers holds offers from many top schools and has visited Florida several times last fall. South Carolina offensive line commit Issiah Walker has said Florida was a school that he was highly considering when he visited Gainesville this fall. Walker is a high priority for the Gators in 2020. The Gators currently don’t have a 2019 defensive tackle committed but this weekend they will 2020 defensive tackles Johnnie Brown and Jordan Butler. Brown says he likes new defensive line coach David Turner and is looking forward to sitting down with him this weekend. Defensive ends Morven Joseph and Chantz Williams are also scheduled to be in town this weekend. Williams is teammates with Jalen Rivers and like Rivers has been on campus in Gainesville a lot over the past year. Florida State linebacker commit Keyshawn Green also says he will be in Gainesville this weekend for junior day. 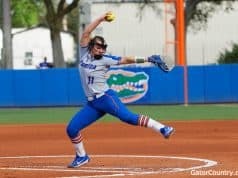 This will be Green’s first visit to Gainesville this year. Defensive backs Lejond Cavazos and Henry Gray are scheduled to be in town. Cavazos is a former Ohio State commit and teammates with Josh Griffis. Lakeland defensive back Fenley Graham had a big state championship game and shortly after received an offer from the Gators. Florida is one of the top teams for Graham early on. Defensive back Jahquez Robinson is a prospect that has been picking up big offer after big offer lately and was one of the first prospects Torrian Gray visited once he got the job. Oregon athlete commit Avantae Williams still has a lot of interest in the Gators despite his commitment to Oregon. Williams is slated to play safety at the next level. 2021 defensive back David Daniel is also expected to be in town for his first visit to Florida this weekend.